I know mine is not the only neighborhood in town suffering from this problem. Like many others, 2 feet of water caused terrible flooding in our basement last Tuesday. Fortunately it was immediately sucked out by our sump pumps — but the damage was done. The high water mark on an “06880” reader’s garage is very high. We have lived in our house for 9 years. We had a similar problem once before, but it only resulted in 4 inches in the basement. It is my observation — and that of my neighbor, who has lived in her house for 30 years — that this is a progressively worsening problem. It is due to the huge swaths of land that have been cleared, so new homes could be built behind ours. Where there used to be trees and forest, there is open land. The new houses are bigger than others. There is nothing to absorb excess water. It just runs over the huge lawns to the lowest point: my driveway. My drain can’t keep up, so it backs into the basement. Another view of recent flooding. My parents — who live in another part of town — have seen huge rivers of rain wash down their road, which they never had in the 30+ years they have lived in their home. They think it may be due to huge houses being built in the neighborhood above theirs. Is this a larger town issue, with all the new construction and water being diverted as it hadn’t before? Is there a way for me (or anyone else in this situation) to have someone from the town look into this? If so, who would that be? I know the weather has been more extreme, but I think there is more to it than that. Any insights from “06880” readers would be appreciated. This entry was posted in Real estate, Weather, Westport life and tagged McMansions, Westport 2018 floods. Bookmark the permalink. Absolutely true. The town hasnt cared about the consequences of allowing huge houses to be built in flood zones and wetlands and residents are paying for their indifference. In 43 years on Webb Rd, had to install sump pump to deal with back yards regularly turning into lakes after town ignored our protests about construction on wetlands behind us. It’s all about the $$$. We took our concerns to Town Hall and the Conservation Dept specifically. They gave me a pamphlet entitled ‘Sasco Creek Water Management Area’ and suggested that I read it. Very helpful advice? All they’ve done is label a wet lands with a fancy term; but it’s actually a flood zone. Good luck putting the impervious surface genie back in the bottle. We’ve laid waste to our environment here since the middle of the last century and it’s done like dinner. That’s one of the many reasons I had a good laugh when I read yesterday’s looooong self-congratulatory announcement that Westport has won an award for “sustainability”. Right. Is there a Thelma & Louise award for excellence in developmental depravity? As someone who lives less than four feet from a rushing stream that has the power push buildings off their foundations in a flood, my advice is simple: harden your property so that it can endure adverse rain events such as we’ve witnessed recently – because conditions are only going to continue to deteriorate. It’s always a good idea to try to channel water away from your home. In the photos, the downspouts appear to be discharging near your garage. Ideally they they would discharge to a low spot on the property or to a dry well. Also, perhaps a gravel driveway would absorb more water than impervious asphalt. If you have the right slope, it may be possible to install a gravity fed drainage system leading from under your basement away from the house. We just did all of these at my mom’s house. Problem solved. Developers have been permitted to build big homes with large footprints all around us in the designated wetlands and FEMA flood zone, this was not the case when we renovated our home 25 years ago. The consequence of this has been extreme flooding on our property and in our home. Old beautiful trees have come down on our property, the creek overflowed, the culvert compromised and caved in. During the last storm my neighbor was outside in waders, flood water up to her thighs attempting to unclog the storm drain. Storm drains cannot keep up with the water that has been displaced by recent construction. The environmental impact of the over-development is irreversible and heart-breaking. What has happened to our town? Maybe consult a civil engineer who should be able to establish the root cause and cost to fix. My opinion comes from 1st hand experience. I feel for all families affected by the recent storms! I want to make a shout out of thanks to Basement Water Systems! Had our basement fixed about 10 years ago and never have to worry for about seepage or water ever since! I admit that I do not live in Westport anymore. I am a native and I remember the big building boom in the 1950’s. Charlie and I now live in the greater Houston area and know well the dangers of over building in flood plains and wet lands. Too much concrete is a huge problem. Even though developers and builders are required to provide drainage systems and even provide drainage ponds. They call them lakes to romanticize what they actually are and raise land prices because you are “on a lake” they often cut corners or get variances to build on the flood plains. Remember Harvey! This does not help you but hopefully indicates that we are having more frequent weather events and the problem is wider than Westport. Some possible solutions were mentioned above but ……. After Hurricane Ike, ( 08) Galveston Island would not allow people to replace their driveways with concrete. At this moment I can’t remember what the product people were allowed to use was called but it looked good and allowed for drainage. I’m with all of you. P.S. 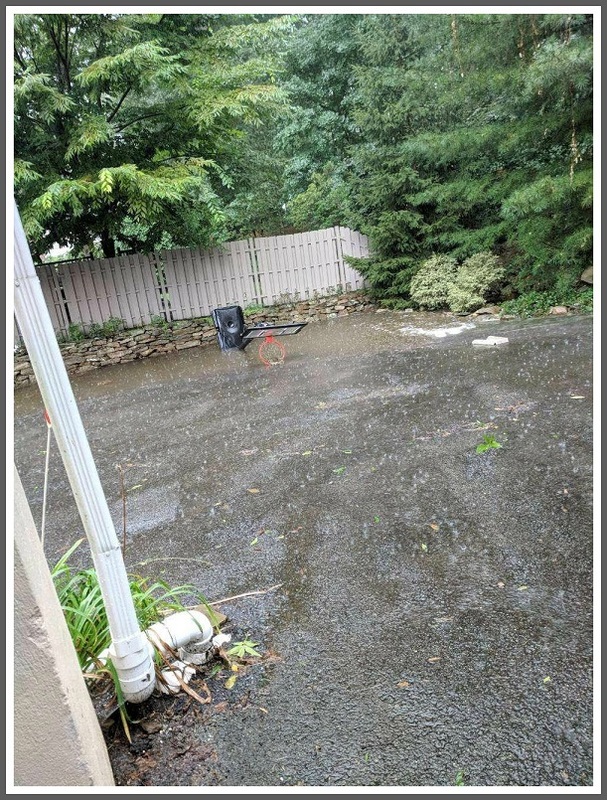 I was in Connecticut the day of the last rain and did not venture into Westport because of the rain and what turned out to be flooding. It would be worrisome to live down at the beach now. The overbuilding plays a part in it, but the town could not predict the more frequent and severe weather events that global warming is causing. When your administration doesn’t believe in science or global warming, and nothing is being done to protect the earth from continued human mistreatment, it’s only going to get worse I’m afraid. I guess as one of the other commenters said, do what you can to protect the house with drainage etc. So sorry for all of your aggravation. I am a new homeowner in Westport (not even three months), and I am losing sleep about the decision we’ve made moving here. I’ve always lived on the West coast, where the cities provide sewer, water, and utilities. Every house is hooked into a city owned drainage system. I understand Westport was built before master planning was available, but I wonder if the city can expand/improve its drainage for all residents. I know it will be expensive but it appears to be necessary. The fend for yourself attitude is very worrisome to me. I keep being told that “it never rains like this,” but the reality is does rain like this, and we need to have the resources to handle it when it does. My sympathies go to the original poster and everyone who has been negatively affected by these storms. Yes, my family and I live on a pond near wetlands not too far from Cross Highway. There have been several large houses built nearby in recent years, and the low area near the pond has turned marshy even in dry weather. It’s a full-blown swamp right now. I agree that developers in this town have had too much leeway. I don’t know enough about land engineering, the law, or local politics to have much of an idea about what can or should be done, but I would like to see better controls in place. Reading the story and comments above, and looking out my own window, I fear that our town’s physical foundation may be in jeopardy. The downspout in the garage door photo is in the absolute worst possible position. Redirect it and you likely reduce future flooding. The above images are an all to familiar site in my neighborhood at Hiawatha Lane Ext in Westport which is in a designated Flood Zone and sits directly adjacent to Wetlands. Now a Developer is attempting to build five yes five apartment building with underground parking garages in our neighborhood right next to the Wetlands. Replacing valuable resource of ground and trees with concrete foundations and asphalt. We residents and those who live in areas such as ours know all to well what the result will be. Needless to say we understand the danger and are opposed to such a drastic proposition and are working to stop it. I’m off Lyons Plain Rd, in Weston and have dubbed my home, “the house of drains.” I, too have a one car garage, almost exact same set up – down spout is on the left. I had a drain installed beneath it and it helped tremendously. I do have a town drain that goes underneath my driveway and down the hill. I had to install an additional french drain, in front of it, with pipes. I also had a swale put in in the backyard b/c my neighbor built a stone wall that leaks like a sieve. Conservation doesn’t care, but they’re great about handing out pamphlets. Good luck! We have lived at the beach now since 1971. Our property in fact is at the low point in the Compo Beach Basin. Occasionally we would get minimal flooding in heavy rainstorms. Of course we were also inundated during Hurricane Irene, SS Sandy and the December 1992 unnamed storm as well as less remarkable tidal incursions. But getting back to rainstorm flooding it is clear to me that the town bodies who are supposed to protect us have caved to the builders. Small beach cottages have given way to monster mini mansions squeezed into every inch of the 50 x 100 lots here at the beach. In addition Compo Hill, once grassland when we moved in down here has been developed to the extreme with paved driveways and roads which act as giant sluiceways leading to an overwhelmed storm sewer system which simply cannot handle the massive amounts of water in these heavy rainstorms. There seems to be very loose standards by the ZBA/P&Z to lot coverage laws. This has got to stop. I feel there would probably be similar circumstances in other parts of town but I cannot speak to them. Bottom line….ZBA…Man/Woman up and hold the builders to the lot coverage zoning restrictions. I would welcome Town officials weighing in on the accuracy or inaccuracy of these comments from a regulatory perspective. I’m no town official, but the inaccuracies sure are flyin ! As to inaccuracies I would surely like to know how many coverage variances were granted here in the beach area in the last 20 years and what was the “hardship” claimed. I stand by my comments of 50×100 lots being filled to the brim with all the new construction. Many on Fairfield Avenue for example are have a footprint nothing like the beach cottages that were originally built there. Same goes for Danbury and Norwalk. The flooding here at the beach from rainfall I know from experience has increased by at least a factor of 2. Why? I claim heavier and more frequent heavy rainfalls AND over building. There is a variance coming up at 38 Fairfield to Build a swimming pool at the lowest point at the beach. All the neighbors including me have written letters of opposition. I intend to go to that hearing when it’s scheduled not only to speak personally about my objection but also to listen to the “hardship” that the new owner will plead. As a Westport native, having lived subsequently in the towns of Bridgeport, Fairfield, Easton, and Trumbull, I can say that I’ve never experienced this type of frequent and destructive flooding before. My current home in Trumbull is approximately 400-500 feet above sea level, and my property in particular is on top of a rather steep hill of a road. But even though my basement remained dry, my neighbors across the street had significant basement flooding, and down the hill from our area, the roads were blocked and undrivable. So, it’s happening everywhere, for whatever the multitude of reasons. All I can say is take whatever preemptive measures you can to mitigate water issues, but I feel like it’s an uphill climb, from here on out. Another point occurs to me. The north side of Westport is on a rock shelf. I’m not sure exactly how large that area is but many homeowners in the 50’s and 60’s when there was significant building in that area had to blast rock to create basements. Most of these shelfs had underground streams running thru them. Most of the time these streams were trickles or benign but in heavy rains turned into rivers of water that would penetrate basement walls. (I know this to be true because my brother who owned a home on Pequot Trail was so affected). I opine that these storms we have experienced in the last two weeks created more significant intrusions in basements fitting what I have described and overwhelmed the ground’s ability to absorb the water leading to major league runoff into normally satisfactory storm drain capability now overwhelmed. I have lived in the same house for 35 years and never have we had flooding before this. Climate change is here and the heavy rain and high winds will continue to bring destruction to our town but I believe that the overbuilding in Westport has caused irrevocable damage. I live on Roseville, where the wetlands run in a serpentine manner through various cross streets but most of the water ends up around Myrtle. The builders clear cut with abandon and shove dirt,sometimes heavily loaded with older building debris and the level of the new clear cut is often higher than before. The wetlands cannot handle the run off. Go to cocktail parties , sports events or whatever around town and it is a topic that invariably comes up, People’s homes and quality of life are adversely being affected .Sadly, I do fear it will only get worse. 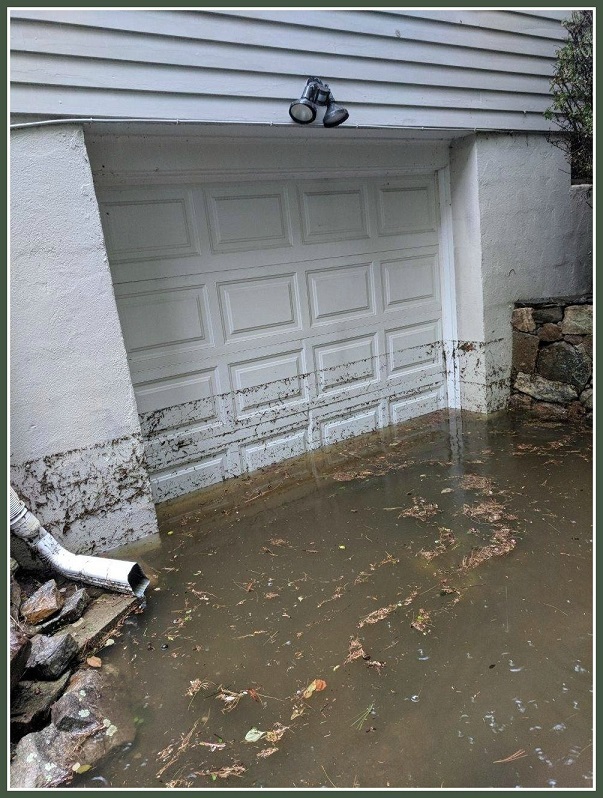 I have lived on Ruta CT off Long Lots Rd behind the old Bertucci’s for 28 years & had NEVER experienced flooding in our finished basement until the recent 2 Tuesday rains. All 4 liviing spaces there were totally destroyed and because we don’t live in a flood zone & didn’t have flood insurance nothing was covered. I agree that the giant overbuilding allowed by town officials play a huge part. Directly behind us – in a formerly wooded & wetland space – there is a new develop of townhouses, apartments & retail. The owners clear cut the property, but agreed to plant before building & then reneged on the agreement. In calling everyone from P&Z, Dept of Public works & Conservation in town, I found out that this owner/builder has not put in their new drainage system and actually have 5 years to do so!!! How can I repair my home when i’m Aware this can continue for another 4 1/2 years? This is ridiculous! We were told that the builder has rights – but apparently we don’t. So they are allowed to build, given lenient timeframes, destroy native habitats and contribute to resident’s homes being flooded with no consequences. I too would like to see town officials address this – an open Town Meeting?